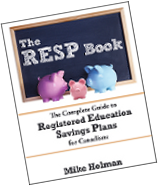 Setting up an RESP account can be a daunting task. There are many RESP rules, plus you have to figure out where to set up the account and what kind of investment products to buy. Mutual funds, ETFs, and asset allocation are not the sort of thing most new parents want to spend time learning. This article will show you how to set up the safest, simplest and cheapest RESP account. If you want something a bit riskier, keep reading because we’ll show you those options as well. The quickest, easiest and safest RESP account is an RESP GIC account at your local bank branch. All the major banks have this type of account and they are all very similar. Cheap – No annual fees. Convenient – There is probably a bank branch near you with reasonable hours. Easy – Just show up and let the bank employee guide you through the set up forms. Versatile – You can contribute once a month or once every five years. Whatever you like. Grants – Eligible for all government RESP grants. Not permanent – You can always transfer the money to mutual funds or ETFs later on. Attract gifts – Relatives might be more inclined to contribute money to an RESP, rather than give the parent money directly. Does your child really need more toys? 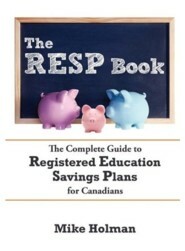 The main benefit of RESPs is the 20% government grant on eligible contributions. A GIC account allows you to easily set up an RESP account and receive your RESP grant without worrying about losing money or having to learn about different equity products. Don’t worry about needing a lot of money to get your GIC RESP started. Typically you can start an account with $500 and contribute as little as $25 monthly. Before going down to your local bank branch – make sure you have a SIN card and birth certificate for each child as well as the SIN card for the parent opening the account. Note – You don’t have to be the parent to set up an RESP for a child. Learning how RESPs work isn’t mandatory, but it will make the account setup process at your bank much easier. Tip #1 – Just get the plain Jane GICs. GICs that are “linked” to equity growth generally have higher fees and are not a good deal. If you want equity exposure – get a different product for that. Tip #2 – As the child gets closer to school, match the GIC maturities with the planned withdrawal date. For example, if the child is starting school in three years – make sure the GICs mature in less than three years to avoid early-redemption penalties. If you have a large RESP, you won’t need all the money when the child starts – some can be available for 2nd year, 3rd year etc. Ok, so maybe you think GICs are too boring. Having a stake in the stock market is what you need to keep the blood pumping. But, you still don’t want to learn anything about investing and can’t be bothered with changing the asset allocation to make the RESP account less risky over time. The year in the fund version corresponds with the year you hope your little monster will start college. One of the mandates of this fund is to change the asset allocation over time so that it invests mostly in equities in the early days and changes over to mostly (safe) fixed income in the years just before the money will be needed for education. This means that your money should be relatively safe in the last few years before withdrawal which is key. The earlier years will not be very safe, but if the markets are good – the final RESP balance might be quite a bit higher than with a GIC account. The annual fees (management expense ratio) starts off at 1.85% and declines slowly for the first 10 years and eventually ends up at 1.0% per year. You are definitely paying for convenience with the high MER, but if you want a no-hassle equity product that reduces risk over time for your RESP, this is a good choice. This fund is available through an RBC mutual fund account. And now we get to my personal favourite – the TD Canada Trust e-series RESP. This account is a bit of a hassle to set up and you have to be a Do-It-Yourself investor since nobody will be helping you. You can set the safety level of this account by increasing or lowering the equity/bond allocations. If you choose 100% equities, this portfolio will be very risky. Set up a TD mutual fund account. Make a purchase to the money market fund. Convert the account to a TD e-series account using this form. Here are more details on how to open up a RESP account for your child using TD e-series funds. Cheap is relative. After having an RESP with TD’s e-Series for about three years I wouldn’t recommend them to anyone. The nominal cost is low, but the frustration of dealing with TD adds-up! I’ve moved to RBC now and their responsiveness beats TD hands down every time. Thanks for the info, Schulzter – I guess TD is not for everyone. Interesting Schultzer, that’s the first negative comment I’ve read about the TD E-series. If you don’t mind me asking what was so negative about the experience? I personally haven’t used the funds, but PF bloggers rave about them being the absolute pinnacle of index investing for ease and fees. Mike, would you say for a lazy investor those close end funds are the best deal? I have ultra conservative friends, and when I try to convince them to get exposure to equities if their child is 5+ years away from needing the money they get all upset and spout the usual jazz about not gambling with their child’s education. If I were to present the close-end fund idea to them it might appeal more, and the MER would quite likely more than be made up for in investment returns as opposed to bonds/GICs. @MUM – Are you referring to the RBC fund? I don’t think they are cheap, but if you want equity exposure and don’t want to worry about reducing risk as the child gets closer to school – it seems like a reasonable alternative. @MUM The idea behind the e-Series funds is that you do everything electronically – make contributions, buy & sell funds, get confirmations & statements by PDF, and use e-mail if you have questions. And being a geek I figured lowest MER plus everything electronic was perfect! Finally someone who got it!!! Most of that works fine. But when you e-mail them a question it can take days to get a response and the response is usually garbage – you either have to re-state your question or you end-up phoning them. When you do phone them (or go to branch) they tell that you’re an e-series customer and you should use e-mail, so you have to explain that you did but the e-mail said to call/visit. Except no one knows anything about the e-Series funds since they’re supposed to be handled electronically so they take much longer to find your answers. The other issue with a TD e-Series RESP is they haven’t really setup Family RESPs yet. They’ll label it a “Family” account but then they’ll open separate accounts for each child and just mention a common family account number in the comments. You have to have separate investments, statements, etc. With RBC I’ve had very productive e-mail exchanges with multiple back-and-forth in the same day! With a seamless hand-off to an advisor by the e-mail rep when necessary. I have to admit my experience with Qtrade has been similarly positive to RBC’s. I don’t know how they do it, but I just send e-mails from my regular e-mail account and they know how I am, and they answer my questions quickly. If only RBC & Qtrade provided statements by PDF they’d have everything TD e-Series has but ten times better service! After woking at TD for almost 5 years I have dealt with hundreds of RESP setups, the key to having it set up correctly is finding an experience Financial Advisor. The same goes for a new RRSP or RRIF. The amount of paper work involved in these set ups is overwhelming and without proper experience the representative will often forget pages. I recently set up our RESP fund via TD, and then converted to E-series. I haven’t attempted the Family RESP as of yet, so cannot comment in that regard, but I’m glad to hear someone has finally received some decent service from RBC…its about time. I’m glad to know about the E-series mix ups. I generally put a little bit more of a premium on service than most PF bloggers (I simply am not as confident due to a lack of banking experience) so I’m pretty sure my feelings would be similar to yours. Plus, I currently have my banking with RBC anyway so that is another stroke in favour of the old K.I.S.S. Principles. I’ve had the TD e-series RESP account for about 4 years now. My experience. Initially, i set up the RESP with TD Waterhouse, this was for child #1. This was nice and easy to set up and select the e-series (or any other) funds. The only issue was that i hold my regular accounts at PC financial so if i want to contribute to the RESP i had to visit a TD branch and pay a cheque into the TD waterhouse account. This very quickly became frustrating. The other frustrating thing was the fee associated with the TD Waterhouse RESP account ($25 per year i believe). The fee is waived if you have an RESP balance over a certain amount, but in practice one would never achieve the required balance over the life of the plan if only contributing the minimum amount to get the maximum grant. In any case, when child #2 came i decided to switch/transfer the account back to TD Canada trust and their mutual funds and open a separate one for each child (the age difference between #1 and #2 was enough to make me avoid a joint account). The setup was relatively painless. I followed the steps discussed in this blog and others, didn’t mention the e-series funds and jumped through all the hoops. As of now, i have two TD mutual fund RESP accounts up and running and the only pain is the fact that i still have to go into a branch to see a mutual fund advisor to deposit money (via cheque) into the accounts. I then invariably get the questions about how my asset allocation doesn’t match the profile they have on file etc etc…The other pain is that i usually dump the cheque into a money market fund while i work out the asset allocation, however, i then have to wait another 30 days to avoid early redemption fees when switching the money from the money market fund to the e-series indexed funds. All in all, it’s relatively painless to administer, but if i kick the bucket tomorrow, i don’t know how my wife would sort out what’s going on! @Col – I was able to setup a pre-authorized purchase plan from within the e-series account so that money was withdrawn from my regular chequeing account (not at TD) monthly. And I could make additional purchases when I wanted since there was a link to my chequeing account. Maybe PC Financial doesn’t support this, but between TD & RBC it worked fine. Also, double-check, but usually Money Market funds don’t have the 30-day holding requirement. Typically, as long you keep your money with the same institution you can ignore the 30-day requirement on their mutual funds (but again, double-check). I quick comment about TD e-series Money Market account: I am setting on RESP this week, but I already have a few e-series accounts and there are no early redemption fees on the Money Market stuff. I send a payment to a money market fund every paycheck and then invest it (balancing as I go). Never was charged a fee in over 4 years! Sun Life also offers target date investment options called Sun Life Milestones Funds. Their target maturity dates currently are 2020, 2025, 2030 and 2035. If the investor holds the investment to maturity, they are guaranteed to receive the higher of 3 guarantees: 1) $10 per unit (the net asset value per unit at the inception of the fune); or 2) The highest month end value per unit; or 3) The final maturity value per unit. The funds automatically become more conservative as they approach their maturity date. They are automaticall rebalanced, so that the investor does not need toworry about selling equities and buying fixed income securities. The money is invested in indexed funds. i.e Segregated funds tied in with indexed funds. The split is 60% Equity Funds, 40% Fixed Assets(TSX, International funds, Gov’t Bonds). There are NO upfront fees with the plan, but there are internal fees for the Segregated funds 3.8%, but that is because there is a 15% bonus at the end of 17 tears, applied to your acct. This is what I was going to go with until I read your post here. I would greatly appreciaite your recommendation if this is a good choice or do you think I should go with the TD e series you mentioned. About the TD e series, I am abit confused as to where to you invest the money, is it in stocks mutual funds? If you can kindly clarify where the money is invested and at what rate, it would be apprecaited. Marjan – I would personally stay away from the IAPLIFE RESP education savings. We want to move our childs RESP from IAPLIFE – and to do that we will be charged $900 (50% of the past 18 months payments (we pay $100 per month) on top of that there will be other fees to exit. The reason we want to close it and transfer the funds elsewhere is because when we opened the IAPLIFE account we also opened a TD RESP e-series account for our child – when I compare the two the TD-e series is doing much better and less fees. Once we pay the fees above we will get less money than what we contributed. Good luck – at least now you can make a better informed choice and ask about the fees involved in closing/moving the account. Marjan: In addition to being in a relatively risky fund with huge end-loaded fees, the MER fee was crazy with IAPLIFE. I believe somewhere around 3.44%. The one thing no one mentions is the banks don’t offer much in the way of solid advice for RESPs. When I spoke to our TD advisor she wasn’t even certain about which grants we qualified for and she didn’t disclose any of the fees on the plans. I get that MERs come off of the “interest”, but still want to be aware of what’s there. Of the fund options TD showed us, they only had data starting in 2008, which I thought would skew the “real returns”. i mean really, my oldest was born in 2005. If I had started with TD then I surely would have seen significant losses in mutual funds. At a minimum I wish they would paint a more accurate picture. What do people recommend for an RESP for a child who was just born?